If you’re looking for an age-restricted 55 plus community in Central Florida that allows you to live an active lifestyle on a typical baby boomer budget, you’ll find what you want – and more – at Lake Griffin Harbor. Nestled right on the edge of one of the Sunshine State’s aquatic gems, Lake Griffin, this community of high-quality manufactured homes in Leesburg offers plenty to do inside and outside its gates. For boat-owners, our 55-slip marina offers easy access to the lake and connecting waterways, or you can keep your boat in dry storage and use the convenient boat ramp to launch into the water when desired. 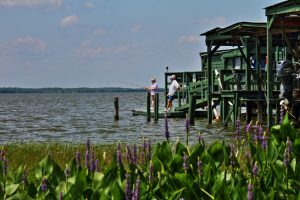 For anglers who prefer fishing from the land, we offer a fishing pier, and for others who just want to enjoy watching the water and the antics of the abundant wildlife, there’s a spacious observation deck. Just think: For a low, monthly home-site lease fee, you receive daily access to all these amenities in our meticulously maintained gated community. In addition, you’ll be living an easy drive away from some of the world’s most renowned beaches, theme parks, shopping, dining, sports venues, and more – all the attractions that many mature adults look for as they search for the ideal 55 plus community. But seeing is believing. The best way to find out whether Lake Griffin Harbor is the 55 plus community you’re looking for is to schedule a visit. Contact us today to arrange a tour and see how you can enjoy an Affordable Active Lifestyle in sunny Central Florida.